It's unquestionable that if Hillary gets into office that the 2nd amendment will be 'reinterpreted', that means no private ownership. While it's hard to conceive of that in today's climate, look what happened in other countries and look what has happened in many of our states, especially those under the 8th circuit. It *WILL* happen if she is elected. Also, if one examines her past actions there will be a rapid erosion, I would call it a landslide, of other personal rights. The 2nd amendment is just the beginning. I forgot to mention, probably because I 'assume' everyone already is totally aware, that Hillary, if elected WILL appoint at least 4, possibly 5 Supreme Court Justice's. These people will make the rule-of-the-land, regardless of what the Constitution says, and will rule for life. This will completely, and I do mean COMPLETELY DESTROY what we now call the American way of life. Thus the #1 reason to fight, expend evenry necessary resource, to ensure Hillary does NOT become president, is to prevent her for being able to pack the Supreme Court with Socialist/Liberal judges that believe we, as citizens, are to be ruled over and controlled. How do you interpret that to mean she "supports" an Australia style seizure of firearms? She clearly states she does't know a lot about it, but is worth considering. It is not a talking point. Furthermore, a review of the democratic party platform mentions nothing about taking firearms from Americans. The Democratic Party does support abolishing access to many of the firearms Americans want, namely the so-called assault weapons. That is a valid point of contention for gun owners. But this concept of disarming America is not in the party platform. I am neither supporting nor condemning Clinton, but I think the discussion should be based on fact and not opinions of a slippery 2A slope that hasn't yet surfaced after eight years of Obama. Oppose or support her for what she said, not for someone's interpretation of what she said. Don,thanks for weighing in on this. My mama told me you are judged by the company you keep. Her husband passed the "assault weapon" ban of 1994. That's the company she keeps. She has stated her desire to revisit the same. Background checks and an assault weapons ban might not stop every attack—but they'll stop some, and save lives. We need to fight for them. 10:29 AM - 13 Jun 2016"
This gun is too small: "Saturday night special." This gun is too big: .50 cal. This gun has a bayonet lug, flash hider, etc: AR-15. Don't forget, she said the Supreme Court got it wrong with the Heller Decision. If you are not familiar with that decision, it would be worth your time to research it. If she gets to appoint one or two justices, they could turn Heller on its head, effectively destroying the meaning of the Second Amendment. Now we know that the sitting president has commuted sentences of criminals who were convicted of being "a felon in possession of a firearm". More gun laws of any sort will not compensate for such irresponsible action. The so-called assault weapons closely approach the individual weaponry contemplated by the Founders; that is, the equivalent to the musket carried by the soldier of the day. I guess you would prefer not to regress to the manual typewriter, much less the quill pen or Gutenberg Press. 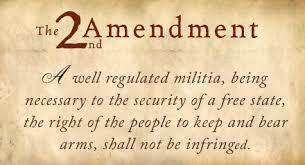 Neither are we willing to revert to the single shot rifle or muzzle loading musket.